While in Perth I dropped into to see Ben Killigrew at the UWA Pilbara Project, which is looking at setting up an office in north Western Australia, with research and teaching facilities. The project office is next door to Spacecube Co-working space, and I suggested UWA look at the design of such shared offices, as well as university learning commons for their Pilbara facility. Universities face a difficult choice when setting up satellite campuses. Buildings are expensive fixed assets and require staff to run them. The staff and students, research and teaching needs will change over time. Very small facilities, typically one building in a country town, have their own challenges in terms of keeping them staffed and used. It happens I visited UWA Albany Campus in south Western Australia some years ago, when a consultant for government. This was in a restored historic building, with a good layout of small tutorial rooms and offices. The University of Canberra Inspire Centre is a good example of a new purpose built stand alone facility worth a look. It has the white-board paint, hard-wearing floors, folding furniture on wheels. For the redesign of the ANU CIST Building I proposed removing walls to create one large multi-purpose spaces, retain some glass walled tutorial rooms and have a cyber-cafe/reception area, as is now usual for learning commons. Another option is to incorporate the university facility in a larger community complex. Gungahlin College and Library in North Canberra provides an excellent example of a combined facility. The one building has a TAFE, school and community library. The TAFE and library have their own areas of the building which can be closed off when required, but can share facilities. The Australian National University, where I teach, has selected Echo360 for recording lectures in lecture theaters. This will replace a bespoke system called "Digital Lecture Delivery Service" (DLD), which has been in use since 2004. So I dropped in for a demonstration of the new system from Jo Williams at Echo360's Perth office (the product was originally developed at UWA in Perth and then commercialized). It happens I had seen an early version of this system in use at the UWA's Albany campus, when a consultant for government. At its most basic Echo360 works like DLD in the lecture theater. The audio is recorded from the same microphone used for the lecture theater. Whatever is on the projection screen is recorded as video. This is usually slides, but can be a document camera recording material, including hand drawn diagrams. Optionally a video of the presenter is also recorded. The presenter just as to remember to start the recording and stop it at the end, whereupon the system makes the recording available via the Learning Management System (LMS), in the case of the ANU, this is Moodle. The student just need a web browser to play the video (PC, Apple Macs and Linux). Students appreciate having recordings of lectures, for ones they miss or want to go thorough again (students where English is a second language find this particularly useful). Also this is a quick, easy and cheap way to create content for a distance education course. Research shows that a recording of a live lecture with poor quality video and all the unedited gaffs is just as educationally useful as a professionally produced video. Echo 360 offers some intriguing extra features, some already in the product and others in development. The lecturer can record their lecture at their desk, using software on their PC or Apple Mac (unfortunately Linux is not supported). They can also annotate a recording they have made live in the lecture theater with extra notes for the students. Also notes from students can be shared. Students can pause the recording of a lecture, rewind and fast forward. An intriguing future possibility would be to pause a live lecture. I discussed the possibility of this in the conference talk and paper "Synchronizing Asynchronous Learning: Combining Synchronous and Asynchronous Techniques", and wrote a project proposal for a student to write "Software for Synchronised Asynchronous Constructivist e-Learning". The idea would be to break down the division between what is real time and what is pre-recorded. Another intriguing possibility is to combine large group interactive sessions with students live in a room and on-line. The use of this form of "interactive engagement" is still controversial at ANU when used just in a classroom, without adding the complication of on-line students as well. However, combining the on-line and classroom students could enrich the experience for both and make it much more lively. Professor Barber, Vice Chancellor of the University of New England (UNE), is reported to be suggesting changes to regulations to make it easier to set up new Australian on-line universities. Rather than create new on-line only, teaching only universities in Australia, I suggest that the barriers which separate distance/on-campus, full-time/part-time, coursework/research should be removed for all higher education. All students and universities should be funded and treated the same. A university might decide to specialize in one area, such as on-line education: there should be no special rules to prevent this and no need for special rules to encourage it. Current rules should be "flipped" so that part-time, on-line, life long, multi-institution learning, incorporating coursework and experience/research is assumed the norm. This would still allow for less common full-time, on-campus intensive programs, specializing in coursework or research. It is not clear what Professor Barber thinks is holding up creation of an Australian on-line only university, or why UNE could not simply expand its on-line offering to satisfy the perceived demand. UNE was a pioneer in distance education, with its "Armidale model of Distance Education", being adopted by the UK Open University (UKOU). The UKOU received very generous special funding from the UK Government to be established, but then went through the same registration process as other universities. If there are barriers to on-line unviersites in Australia, these should be removed. But the spcial access to resources which UKOU received (including special access to a BBC TV channel) should not now be needed, due to the much lower cost and ubiquity of communications technology. Australia previously had Colleges of Advanced Education (CAEs), which were teaching only institutions, offering courses at an educational level above those of Technical and Further Education (TAFE), but below unviersites. In the mid 1990s the CAEs became new universities, or campuses of existing ones. As universities the former CAEs are required to carry out research as well as teach. Online learning is lower cost when used with large volumes of students. However, this requires a high initial investment in course design and highly trained staff. Most Australian university academics are not currently qualified to design or deliver on-line courses. Global choice of online courses will be limited by accreditation requirements. There is likely to be a flood of poor quality, unaccredited courses. Online learning allows for learning while employed and in remote areas. However, being a student is still hard work and requires considerable amounts of time. Institutions will require staff to be retrained in online pedagogy and use of technology. This retraining can make use of online technology and a stepwise approach. Online learning can enhance quality and standards through more detailed and frequent monitoring. However, measures to prevent cheating by students will need to be enhanced. Also teaching staff and students will require explicit training in how to communicate online. The learning technology already being introduced to universities and vocational institutions can be ungraded for larger scale use. In particular, Australia is a world leader in learning management systems, by virtue of the locally developed Moodle system, which could be enhanced. Current accreditation processes for domestic courses will require minor modification for online courses. International accreditation will require government or industry agreements. Work by the Australian Computer Society in accrediting global professional qualifications can serve as a model. Governments can assist Australian providers by removing barriers which prevent online courses from being undertaken by students. Government can also set an example by allowing their own staff to undertake online courses and teach in them. As an example, the online engagement courses proposed by the Department of Finance for all Australian Public Servants could be delivered online by Australian tertiary institutions. Australian institutions can be encouraged to join international partnerships for online course creation. Visa restrictions which limit International students undertaking online courses should be relaxed. Currently an international student is expected to be on campus for about three quarters of a full time course. This should be reduced to one quarter. Australian experience suggests that all university courses will be delivered at least in part online, with the typical student spending about 25% of their time in a face-to-face class and 75% online. Undergraduate degrees will have more face to face components, and postgraduate courses less. This will result in a drop in Australian students on campus, but allow for millions more online from our region. With most education online, Australian and international students will be able to choose courses from anywhere in the world. Retaining a proportion of the Australian students and capturing part of the international market will require maintaining Australia's very high standards for accreditation. A national course recognition program, so students can combine courses from multiple Australian universities, would be useful to promote "Brand Australia". The Australian government can also fund Australian academics to reach out to the region. Australian universities are already reconfiguring their campuses with accommodation and "learning commons" to suit the new blended learning. Campuses are being redesigned to be pleasant places to be, not just study. No specific regulatory barriers exist, with online courses being covered by existing regulations on education. However, it would be useful for the Australian Government to advance bilateral and multilateral agreements on mutual recognition of educational standards. Support to professional bodies to advance standards for disciplines would also be of assistance. Australia has Open Universities Australia (OUA) delivering on-line courses. This is a consortium of Australian unviersites (some of which were previously CAEs). The OUA courses are delivered by the individual institutions and while the student can select from courses across several institutions, their degree is awarded by one and they have to meet the requirements of that university. OUA has introduced some short MOOC-like free open courses, but most of the on-line offerings are conventional ones in the format pioneered by UKOU. OUA also has non-university bodies offering courses, including the Australian Computer Society (ACS). OUA offers the ACS course "Green ICT Strategies", which I designed (also run by ANU as ICT Sustainability and Athabasca University Canada as COMP 635). Creating low cost education-only universities would in effect re-establish the CAE system. While universities promote the benefits of research informing their teaching, in practice there is little connection between the research conducted by advanced degree students and the coursework of graduate and undergraduate students. However, I suggest it would be better to reconnect research and education, rather than further separate the two. Australia has a bifurcated system, where advanced students enroll in either a coursework/professional or research degrees. The coursework/professional students are seen to be the exception, with pure research being the main product of the university. This division is enforced by government funding which pays for research degrees separately and more generously. In my view this separation of coursework and research is harmful to the education of all students and holds back innovation. A better approach would be to have all students enroll in the same program, undertake initial coursework and the decide the mix of research and coursework. Government funding should not discourage professional masters and doctorates, as while these may have a smaller component of original research, what they do have is likely to be applied for economic and community benefit much sooner. Another useful reform to education would be to abolish the divisions between full time, part time, distance and on-campus students. Currently government and university rules favor full-time on-campus students. Universities assume a normal student is on campus and has no work or family commitments, and then makes exceptions for others. However, most students are working part time or have family commitments (or both) and can't be on campus all day, every day. I suggest government regulations and university procedures should be flipped, so the average student is assumed to be distance, part time. The average student would be assumed not to be able to get to something at a set time on campus. Educational materials would be provided in a format suitable for distance mode, except where this is not possible. This approach is analogous to the change in the way disabled students are catered for. In the past students were assumed to not have a disability and special arrangements would be made for those with a disability. However, most people have some disability at some time in their life and so the law now requires educational institutions to allow for this. Australian law requires educational offerings to be designed for those with a disability, except where this is not feasible. A university which simply waits for disabled students to ask for special access is acting unlawfully. Another reform would be to encourage students to undertake education at multiple university and over extended periods. At present it is possible, but difficult, to incorporate education from multiple universities. Government policies also make it difficult for students to study over extended periods. The system assumes the student will be at one university and do nothing but their degree and makes it very difficult for most potential students where this is not the case. As an example, last year I undertook a Graduate Certificate in Higher Education at ANU. As I was interested in on-line distance teaching techniques, my supervisor agreed it would be useful to incorporate two on-line courses from University of Southern Queensland (USQ). The process of cross institutional enrollment proved prohibitively complex (on my reading of the rules it appeared impossible, as I was required to get the approval from each institution before the other). To bypass the problem enrolled as a professional studies student, bypassing the cross-institutional procedures and paying the full fee. As an student at two institutions I was required to have two different student numbers and to pay two Student Services and Amenities fees (one for a campus I have never seen). I was then required to pay extra for a printed transcript from one institution to present to the other to have my results credited. An better approach would have Australian students issued with one student identifier for all higher education institutions, electronic results and an exemption from paying more than one Student Services and Amenities fee. Another way that the realities could be recognized would be foAr institutions to allow students to undertake further studies to build on their existing qualifications. Many Australian universities allow multiple exit points from higher degrees (Graduate Certificate, Diploma, Masters, Doctorate). But this is less common with undergraduate programs. Also articulation into a program is usually only allowed from the same university and same program. The Australian Vocational Education and Training (VET) sector has standards applying to institutions which allow students more flexibility. However, these standards limit the freedom of each institution and are less appropriate for universities. After completing the GCHE, I obtained the equivalent Certificate IV in Training and Assessment, so as to teach in the VET sector. Some of the features of the VET process could be applied to universities, but many could not. Australian universities value their autonomy and freedom from government regulation. However, they need to understand they are competing in a world market, not just for international students, but increasingly for domestic students. If Australian universities do not offer students the flexibility they need, then those students can enroll in universites elsewhere. Changes to allow for more flexibility for domestic students will also help Australian universities to compete internationally. As an example, after completing my Graduate Certificate in Higher Education, I wanted to study and research the field further. However, the choice of programs in Australia is limited and restrictive, so I am looking to study on-line overseas. 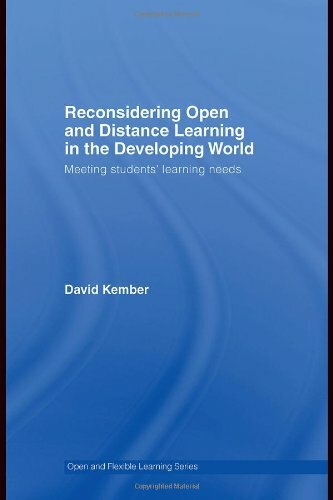 Continuing my browsing of the shelves of the ADFA Library, I came across "Reconsidering Open and Distance Learning in the Developing World: Meeting Students' Learning Needs" by David Kember (Routledge, 2007). This traces the development of distance university education in developing nations, especially as it relates to the UK Open University Model. This is very much a personal account with the author having experience in education in Hong Kong, Australia, Papua New Guinea, Fuji and the UK. While written in the relatively early days of Internet education, the principles are still very applicable today's MOOCs. The University of the South Pacific provides an interesting model, being an institution run in cooperation by twelve nations, spread across a significant portion of the world. Many will find it surprising that the model of distance education made world famous by Open University UK was largely derived from what is called the "Armidale model" at University of New England, Australia. The experience of the University of South Africa, with an unsuccessful attempt at placing computers in schools for distance education, provides a lessen in the risks of technological optimism. Paul Johnson, Vice-Chancellor of the University of Western Australia (UWA) issued "UWA Futures: White Paper" in August 2012. There were responses from UWA academics over the next few months, UWA Academic Staff Association (March 2013). In November 2012, the UWA Vice-Chancellor issued "UWA Futures: The Response". This appeared a useful, if somewhat limited exercise in consulting the university community on a difficult issue, of what a university is. The ANU embarked on a consultation process in mid 2013, but this concentrated on possible budget cuts, rather than the nature of a university. The original white paper suggested that Massive Open Online Courses (MOOCs) from new commercial and not-for-profit organizations will compete with universities for students. The paper argued that UWA should seize these opportunities which result. However that was the only mention of MOOCs in the white paper, so it was not clear what it is proposed to do. The responses discussed MOOCs and the issues with e-learning and provision of technology to students in more details. The paper argued there will be negligible growth in student numbers for the remainder the decade, which seems to me be at odds with the rapid growth in the middle class in developing nations, who can now afford university education. However, UWA proposes to increase its student fees, which could price it out of this growing market. Under "Proposal 1" UWA would "... conduct a full review of pedagogic purpose and practice in 2013, with the aim of introducing new pedagogies from the beginning of 2015". This would appear to be essentially about the role of e-learning, but the large scale Interactive Engagement being introduced at ANU could also be an option. Some of the responses discussed this, with approaches such as the flipped classroom. The UWA Academic Staff Association went further, proposing that MOOCs could be used for teaching, complementing a Humboldtian model of the university, where students are not locked into a rigid program. Proposal 3 envisaged "... personalised mentoring and academic support for all... students...". However, there was no mention of the new skills which staff will need to provide this support, not how they will acquire it. Some responses asked about training for faculty in mentoring. ps: I will be in Perth, WA, 23 September to 18 October 2013. Greetings from the Griffin Room at the JG Crawford Building at the Australian National University (ANU) in Canberra. I am taking part in a planning meeting for "NECTAR, the ANU Centre for Early Career Academics". The issues being discussed are, I suspect, not different to those at other higher education institutions. Early Career Academics (ECAs) have the problem of living from short term project to project, funded often by short term research grants. Some research shows that is can be an effective way to promote innovation, but that is little consolation for the individual who has no certainty of career or salary. One aspect which I would like to see addressed is the professional training and development of ECAs. The ECA tends to concentrate on short term issues of getting the next grant and doing the research, not what they need for the long term. Also there is the assumption that with a PHD they have all the qualifications they will ever need and their career will depend on research excellence. There is also the need to teach ECAs how to teach and be administrators, which is an important part of academia. Most academics have three professions: research in an area of academic specialization, teaching (including supervision of research) and administration. In terms of support Oxford university has a web site: Promoting Academic Practice. One issue I believes requires addressing is the role of adjuncts in academia. Some adjuncts are late career academics who will be familiar with the system, but others will be form industry and so are in effect early career academics. Also the role of the Internet needs to be considered. The role of professional bodies, nationally and internationally is not considered sufficiently when dealing with ECAs. The disciplines which have bodies, especially vocational ones (such as Law, Medicine, Computing and Accounting) have influence at the national and international level. One current issue for Australian academics it is it is not clear which minister in the new government will be responsible for Higher Education, or will different aspects be shared between departments. aspects of academic work most prized. • Overall, less than one third of Australian academics believe that their workload is manageable, while just under one half indicate that their workload is not manageable. Close to half of mid and late career staff indicate that their work is a source of considerable personal stress. • Early career staff are more likely to be dissatisfied with their job security and income than those later in their career - 60 per cent of early career staff are dissatisfied with their job security compared with less than one quarter of late career staff. In the same vein, 40 per cent of early career staff are dissatisfied with their income compared with less than 30 per cent of late career staff. Access to secure and well-remunerated positions is an important consideration for early career academics. • Nearly three-quarters of staff intend to continue in their current role and position in the short term (two to three years). However, substantial proportions of academics have medium to long-term intentions (for the next five to ten years) to: move to another institution (29 per cent); move to an overseas institution (25 per cent); leave the higher education sector all together (26 per cent); or retire (21 per cent). • The intention to leave Australian higher education is highest among the younger age groups. Close to 40 per cent of academics under 30 years of age plan to leave Australian higher education in the next five to ten years, with 13 to 18 per cent intending to leave in the immediate future. Around one-third of staff aged 30-39 years intend to leave in the next five to ten years. • Overall, when both short and long-term intentions are taken into consideration, close to half of the academic workforce intend to retire, move to an overseas university or leave Australian higher education at some time in the next ten years. academics; and 42 per cent are not satisfied with their level of income, compared with 34 per cent of other academics. • Over half of those intending to move to an overseas university, or to leave the sector, cite reasons related to dissatisfaction with working conditions. The most common reasons are around issues of job security, remuneration levels, lack of research funding, and dissatisfaction with the institutional or sectoral culture. • Academics are concerned about the perceived lack of recognition for teaching in existing promotions processes, despite the efforts of some universities to include teaching performance and achievement in promotion criteria: 88 per cent believe that teaching should be rewarded in promotion but only 31 per cent believe it is currently rewarded. ps: The Griffin Room at the JG Crawford Building at the Australian National University (ANU) has a wonderful view out the window. The building is built half into the ground on one side, so the meadow comes right up to the window, with a view down to Lake Burley Griffin. Both the room and lake are named after Walter Burley Griffin, architect of Canberra. The recording of my webinar "MOOCs with Books: Technology Plus Traditional Teaching for an On-line Education Revolution" is now available, courtesy of the SA e-Leaning Unit of the National VET E-learning Strategy. Also available are the notes and slides. See the National Calendar for other National VET events. My next presentation on ICT trends in Education is scheduled for 4:45pm, 12 November 2013, in Canberra, hosted by the Australian Computer Society. I will be in Perth 23 September to 18 October and available to speak there in person. Greetings from the Australian National University in Canberra, where I am attending a briefing on the ANU Workspace Project. In particular the the ANU has decided to move to Microsoft Windows 8, for the non-Linux, non-Apple computers (ANU released a Workspace Project Update in August 2013). Providing desktop computers at a university is a very difficult task. There are about 12,000 computers at the ANU. Some of the computers are on office desks, others are in learning centres for students and some are in specialized labs. ANU is aiming to move desktop computer laptops and tablets to Windows 8. There will also be an Apple Mackintosh and Linux "image" as well. There will be an "App store" for ANU approved applications. Users will be able to install applications themselves on their PCs (license conditions permitting). The aim is to move to Windows 8.1 and OS 10.9 (assuming there are no problems with the new releases). Of course for many users, who spend most of their time in web based applications, the underlying operating system is of little interest. Provided the computers on campus have a reasonably up to date web browser, Moodle, the based Learning Management System, will be accessible. Upgrading operating systems is not an easy task. The extreme case would be Windows XP, which was released 12 years ago. Microsoft is phasing out support for this version and so users will need to upgrade.Computers running XP may not be capable of running Windows 8. In any case it might be more cost effective to replace the hardware, than try to upgrade the software. An alternative for old hardware would be to move to Linux, which has lower hardware demands. There is also the issue with Windows 8 (and Linux) of what user interface to use. Windows 8 has a tile interface designed for touch screen tablet computers (some versions of Linux have a similar interface). The new interface looks very different and it is not clear that it has any advantages for a desktop computer using a keyboard and mouse. There is the option to emulate the old interface. However, new users may see this as old fashioned. At 1pm AEST (0300 UTC) Tuesday 17 July I am presenting a free seminar on "MOOCs with Books" hosted by SA E-learning Support Services, for vocational educators (everyone welcome). While testing the setup on Friday I found the sound was distorted. It turned out the audio mixing software in Linux was causing a problem, which was easily bypassed. About every computer based video/audio-conference I attend has a few minutes at the start where people sort out audio problems. Some of these problems can be solved with low cost hardware. Rather than giving new on-line staff and students a useless gift (such as a flash memory wrist strap), a Push-to-talk Headset (costing about $10) would be useful. Headsets are readily available, some with push-to-talk buttons, but ones with push-to-mute ("cough" function) are rare. So I built myself an adapter to provide this function. The adapter has two 3.5 mm plugs for the microphone and headphone sockets on my laptop. The p[lugs are cabled to a small box with two switches and two sockets. A toggle switch selects microphone off/on. With the switch in the off position, a press button provides "Push-to-Talk". With the switch on the off position, the button provides "cough" function (pressing the button cuts off the microphone). There are 3.5 mm and 2.5 mm sockets for different headsets. The parts for this cost about $12. In "Halt the avalanche of performance metrics" (Nature, 15 August 2013), Colin Macilwain puts a strident case that academics should oppose performance metrics, such as citation indices and other measures of the quality and quantity of research output. Similar arguments have been put opposing measures of the quality of university teaching, such as student feedback surveys. Macilwain 's particular concern seems to be over power moving from the researchers to the university administrators and would prefer for each discipline to be left to run its own affairs. Where academics fund their own research and do no teaching, that is fine. But if someone else (the university overall, some government funding body or a private charity), then some way needs to be devised to measure how effective the researcher is. In the past an old boy's network ensured that a few senior academics recommended their friends for grants. Such a system is not in the public interest or that of the disciplines. Similarly with teaching, some way needs to be devised to ensure the quality of the product. Regrettably, there are still university academics who see teaching as an unfortunate chore which keeps them from their research. Students are seen as a raw material to be refined though undergraduate and postgraduate courses, to produce a few postdoctoral researchers. The students who do not get through a PHD are considered a waste product to be discharged from the university of no further interest. It is not surprising that academics with this attitude get a rude shock when the students given them, low sores for teaching effectiveness, nor that the academics then try to limit the administering and public action of such surveys (not one likes to be told they are incompetent). Macilwain singles out Snowball Metrics for criticism. This is a scheme where groups of academics can devise their own metrics and use software to collate them. There is a "Snowball Metrics Recipe Book" for the UK and it would be interesting to see how applicable this is elsewhere (and how much it has been designed to favour the "distinguished group of institutions" which devised the metrics), Macilwain warns that academics are playing into the hands of those who wish to use these metrics to rate them. However, given I am going to be rated anyway, I would prefer to have some say in how this is being done. Leading universities did not build their reputations on, as Macilwain says, "autonomous academics, working patiently with students". Leading universities have in place systems for the assessment and review of staff. These systems have grown up in an ad-hoc way and may be all but invisible to the outside observer, but they do exist. Academics do not research or teach in isolation, this is a group activity and the group monitors the performance of its members. Performance Metrics seek to regularise and make more explicit the measures academics have always used. This can threaten those who have done well out of the informal systems of the past. There are risks in too rigid measures which are blindly applied by finding and promotion bodies. But there are also risks in clinging to a system which does not accord with general standards in the community. Recently I have been looking for a masters in education to enrol in, so as to learn more about online and distance education. As a consumer, I do look at the various rankings of programs (particularly avoiding those with a below average performance), but will not simply blindly enrol in whatever has the largest score. On Thursday I attended the Canberra MBA & Postgrad Studies Expo and picked up a free copy of Hobsons' "The Good Universities Guide 2014 to Postgraduate Courses: Arts, Education and Social Sciences". The guide is divided into volumes for different groups of disciplines. There is also "Accounting, Business and Law" and MBAs. The arts guide is 214 pages, covering courses offered in Australia by universities (it does not include the postgraduate vocational programs offered some non-university higher education institutions). Also available on-line is Hobsons Course Finder. But I found the on-line guide unusable and the paper guide much better. The guide offers a very condensed set of information about each institution, campus and course, including ratings. I was looking for a masters in education (specializing in on-line distance higher education). The guide has a section on programs in education and training. This starts with a description of the discipline and possible jobs on graduate. The universities offering programs are listed. A table of university rankings, based on student surveys is provided, but it is not clear if this is just for teaching courses, or all courses. All the offerings in each category of program (Graduate Certificate, Graduate Diploma, Masters by Coursework and Masters by Research). The paper guide is useful in that you can scribble notes on it while talking to the education provider at the expo. But the text is very small and hard to read, and it is difficult to narrow down the selection of programs. In my case I wanted a Masters, available on-line, part time, but has to manually cross out all the many face-to-face ones. When I tried the on-line guide I was able to select just what I wanted. Curiously I noticed it had a category of masters not in the paper guide: "Master Degree (Extended)". The on-line guide also included Doctor Degree (Coursework) which was not mentioned in the paper guide. The number of programs listed was too many to be useful. Unlike the paper guide, there was no easy way to scan the results and eliminate irrelevant entries. Also there was no way to further refine the list (for example, eliminating those institutions with below average quality of teaching). The poor user interface of the on-line Hobosn's guide meant that it was of no use in helping select a course (there would seem to be scope for better such online guides). But in the end I did not find an Australia institution which provided an online Masers program in distance higher education, so it looks like I will be studying outside Australia. The Queensland the Crime and Misconduct Commission (CMC) released "An examination of suspected official misconduct at the University of Queensland", 13 September 2013. The report concerns the University of Queensland (UQ) offering a place in its medical program to someone who had not met the requirements for admission, but was the daughter of the then Vice-Chancellor (VC). After the matter was reported to the CMC and became public, both the VC and previous acting-VC resigned. As the report points out, this incident is important in highlighting that conflicts of interest need to be dealt with transparently in public organizations, including universities. While several Australia states have independent commissions to investigate misconduct, there is no such body covering the Australian Capital Territory (ACT), nor federal agencies. As a result, universities in Canberra do not have an independent body to which staff and students can report misconduct. Internal procedures are not sufficient and I suggest such a body should be established to cover all ACT and Federal public bodies (including universities established under federal and ACT legislation). The importance of what happened at the University of Queensland goes beyond the specific events of 2010. The originating issue — a conflict of interest involving persons of considerable power in the institution — could arise in any unit of public administration. The issues raised by this series of events at the University of Queensland are important ones, with wider application across the public sector. Conflicts of interest can and will occur at all levels of the public sector. However, they may not always be immediately evident — they may arise out of a request for assistance, a casual conversation or an oblique suggestion, hence the difficulty in identifying them as a potentially improper exercise of influence. instil an attitude in staff that a perceived conflict between integrity and personal loyalty to senior colleagues should not prevent the reporting of suspected misconduct. From: "An examination of suspected official misconduct at the University of Queensland", Queensland the Crime and Misconduct Commission, 13 September 2013. Recently I was asked by an author about copyright on materials in an academic book. This is a complex area, with different rules on what can be used in a classroom, in the notes handed out to students and in text books. Also the rules differ between text, images, video and sound. The ANU Library has prepared a "Copyright overview" and a list of the Licensing and Collection Agencies in Australia. The paper "Are Tenure Track Professors Better Teachers?" by David N. Figlio, Morton O. Schapiro and Kevin B. Soter (NBER, September 2013) concludes that part time adjunct staff make better university teachers than full time professors. This is a welcome finding for those of us who are adjunct lecturers and hardly surprising. However, I suspect it has more to do with adjuncts having more, and more up-to-date, training in teaching, than anything to do with full/part-time status. Adjuncts are likely to be newer to the institution, so more likely to have been through the teacher-training program which institutions run and also less able to avoid doing it (as Professors can). The paper does not appear to address the teaching qualifications of the staff in the research. There may also be an element of priorities in the difference. When I suggested to one professor that improved teacher training for staff would improve student outcomes, they explained to me that staff were selected and promoted based on their research publication record: quality of teaching was not important. I was a little shocked by this, but if that is what the system is telling staff is important, they can't be blamed for acting accordingly. This may change as student feedback on individual courses and for institutions becomes more common. The Massive Open On-line Course (MOOC) consortium EdX has announced they will work with Google on software and a course provision website "mooc.org" (10 September 2013). EdX and Google will jointly develop the "Open edX" software and make it available to those not in the EdX consortium via MOOC.org. Google will collaborate on research into student learning and technology. While not mentioned in the announcement, one of the EdX members is the Australian National University (ANU), where I have been looking at combining synchronous and asynchronous e-leaning. Also I would like to offer a free version of my course "ICT Sustainability", which is run by ANU in Australia as COMP7310 and by Athabasca University in Canada as COMP635. The EdX/Google partnership makes a lot of sense. EdX's software has been slow to develop and Google has released some rubbish attempts at a MOOC. This partnership will hopefully combine the university's expertise in eduction and Google's in large scale software. Greetings from the Australian National University in Canberra, where I am talking part in "Education Development StudioTeaching & Learning Day: Evolving practice and expectations". David Meacheam, from UNSW Canberra is talking on Turnitin's GradeMark. He argues an online grading system not only increases the teacher's efficiency, it improve the quality of marking and student satisfaction. My experience agrees with this. However, I suggest the same results could be achieved without any proprietary software, simply by training teaching staff in better assessment techniques. I took the USQ course "Assessment, Evaluation and Learning" (EDU5713). Moodle includes a feature for using rubrics, but even without this a teacher can create their own manual rubric and set of standard comments. David also mentioned also this approach allows the institution to show an accreditation body that assessment is linked to course outcomes. Greetings from the Australian National University in Canberra, where I am talking part in "Education Development Studio Teaching & Learning Day: Evolving practice and expectations". The event is organized by the ANU College of Arts and Social Sciences and chaired by Deborah Veness. As well as ANU staff there are educators and researchers from University of Canberra and UNSW Canberra (ADFA). Professor Robert Fitzgerald, Inspire Centre, University of Canberra, started by describing agricultural extension projects for developing nations, using mobile phones and tablet computers. He emphasized user lead design, video and delivery when needed. He then went on to describe the Inspire Centre at University of Canberra, which is purpose designed for teaching of teaching, using a "flipped" approach. He emphasized that purpose designed spaces are needed for this.Rob also pointed out that research shows reducing class sizes does not significantly improve learning outcomes (even from 30 to 15 students), the nature of the teaching needs to change with more active student involvement. He entered a controversial issue by explaining that some University of Canberra courses are combining tutorial;s to have groups of up to 70 students. There has been controversy over similar proposals to at ANU to replace tutorials with large groups. Recently I was asked about "Adult Learning Theory". There is a free wikibook "Learning Theories/Adult Learning Theories". The "Andragogy" Wikipedia entry is useful. The word Andragogy, is clumsy: intended to distinguish theories of adult learning from learning by children: pedagogy. But I am not convinced there is a difference between child and adult learning. In particular the current practice at many universities where undergraduate students are treated more like children than adults in not a good approach. The approach of "Adult Education" is to assume the student is studying part time and has a job or other activities which occupy much of their time. Also adult eduction assumes the learner will take more responsibility for their education, being more self-motivated and disciplined. This is also assumed of postgraduate university students. However, my experience of being an adult postgraduate student was that I still needed structure and guidance. Some universities are claiming their students have graduate attributes, such as multi-disciplinary analytical skills, clear and logical communication and teamwork. But students need to be guided to obtain these skills. The idea that undergraduate university students are full time, on-campus is not the reality. Even "full time" students have jobs or other commitments. Rather than create an artificial distinction between full and part time, on and off, undergraduate and post graduate, I suggest assuming all students will have a range of needs and capabilities. Those students who need support should be able to get it when they need it for the part of their program they need it for. Where a student can manage on their own they should be allowed to. This would be much the same as the approach take to access for the disabled on university campuses. Rather than assume that students don't have a disability and then make special arrangements for those who do, the opposite is done. It is recognized that most people will have some form of disability some time in their life and so the campus and courses are design to accommodate a broad range of abilities. Buildings are design for wheelchair access (which incidentally makes them easier to access for everyone else). Course notes are designed, by default, for those with limited vision (which also improves their general readability). New buildings and notes are designed to be accessible because this is cheaper than modifying them later (and is required by law). In the same way I suggest that university courses should be designed to suit a broad range of students. To the extent possible, the students should be assumed to be distance education students who never visit the campus. It should be assumed the student can, where possible, do the course in complete isolation from other students (such as the extreme case of where they are in a prison cell or a fox-hole on a battlefield). But students should be given the option of human tutor help and group learning. What each student needs will vary from subject to subject and time to time. Health and Physical Education, Civics and Citizenship, Economics and Business, Geography, History, Languages, Mathematics, Science, Technologies, Work Studies and Trades. Australian curriculum standards have been controversial, with state education authorities reluctant to give up control to a central authority. But there has been extensive consultation with teachers, groups and the community. According to a media report, Princeton Professor Mitchell Duneier, has stopped participating in the Massive Open Online Course (MOOC) "Introduction to Sociology" via Coursera. These are reasonable concerns. However, these are not new issues. The effectiveness of on-line education has been debated for at least a decade. The effectiveness, effect on conventional education, and funding of distance education has been debated for at least 100 years. Professor Duneier cannot have been unaware of these issues before agreeing to provide a MOOC. But I would like to hear what Professor Duneier has to say himself about his reasons for stopping the MOOC, rather than relying on a few press quotes. How: Focus on assessment, course materials and feedback. Student activities are important, lectures are not. What: Small regular assessment items, at least two large assignments, minimal exams. On-line course materials, with optional lectures. Feedback with assessment results. When: Assessment every week or two, all course notes and assessment tasks provided before the course starts, mark and feedback within a week of small assessment submission. Better course materials and more progressive assessment would improve course completion rates. It does not matter if a Learning Management System (LMS), or something else, is used to deliver course materials, provided they are well designed. Ordinary web pages and Streams are a viable alternative to Wattle. Using Wattle for all courses would not be a significant improvement. The assessment, course notes and staff contact details should be most prominent on course websites. Details of lecture times should not be so prominent, as students place a low value on lectures and if staff try to make students attend they sound desperate. All lecture notes and assessment items should be provided to student at the start of a course and no changed made, except where errors are found. Just as there is an examiners meeting at the end of semester, I suggest a meeting at the beginning of the semester, where the person in charge of each course presents their course material and assessment design to their peers. There would then be peer pressure to produce clear, complete and consistent work. The Course Description is a little long. I suggest cutting it by one quarter to just two paragraphs. The Learning Outcomes are far too long and I suggest cutting them by half to about four points. They should be derived from some accepted skills standard, such as (for ICT) the ACS Body of Knowledge, Skills Framework for the Information Age, or similar and be explicitly covered in parts of the course notes, workshops and assessment. The Indicative Assessment description is misleading. It says there is almost an equal weighting between Continuous Assessment and Examinations. But the assessment page indicates a large end of semester examination a small mid semester exam and a couple of small assignments. An alternative assessment strategy would be 20% for each of the mid and end of semester exams, mid and end of semester assignments and 20% total for a short lab exercise or quiz each week. However, consideration should be given to eliminating the conventional examinations entirely, as they have little value as an assessment tool. I suggest having firm deadlines for all assessment: late submission should result in a mark of zero, unless special consideration is granted. Students should be encouraged to submit a draft of each assignment at least three days in advance, with failure of the student's computer system (or the institution's computer system) on the day the assignment is due, not being grounds for special consideration (nor would an illness lasting less than three days). Students who have a propensity to submit work late would quickly learn this was not going to be tolerated and change their ways (I find this very effective in my Green ICT course). The web page for the course has a photo which appears to have nothing to do with the topic of the course. Students like to know who their teachers are, so I suggest replacing this with ones of the teaching staff, with links to their bios. In preference to email, provide Moodle Dialogue or similar. This keeps all correspondence with the student in one place, so that all teaching staff can see it. The web pages emphasize attending lectures, but these are the least useful part of a course (and if you have to beg students to attend lectures you sound desperate). I suggest providing more details of the assessment up front, which is what the students consider important. Labs are a useful educational technique, so I suggest communicating this to the students by making all labs assessed. Students can submit material on-line and be marked for it. The lecture schedule should be replaced with a course ebook. This would contain all the notes for the course, provided to the students at the start of the course. The subtitle "to be adapted and refined throughout the course" should be removed, as this says to the students that the course has not been properly designed. Lectures could continue to be held, but it should not be assumed that students attend. Consideration could be given to using a workshop format with min-lectures, but this would require a TEAL type room, large enough to hold all students. I suggest the Weekly laboratories material be inserted in the course notes under the appropriate topic headings. Having many separate documents creates confusion. Peer Assisted Learning (PAL) sounds like a good idea, but I could not understand from the web page how it was supposed to work. Also this appears to be only a face-to-face group. I suggest it be extended with on-line forums. I had difficulty understanding how the postgraduate version of the same course was supposed to work. It seems to add more work for postgraduates. That suggests that either the undergraduate version has less than the usual amount of work or postgraduate has too much.